How the heck are you supposed to have an up-to-date status of your team’s needs, let alone an up-to-date status of project progress? As of last week, we have twice-a-week scrums on Tuesdays and Thursdays. I can glean only a smattering of what the team is working on at these meetings since said meetings seem to morph into I-have-a-problem or I-can-help-you meetings. This format is actually great for this team since they aren't communicating otherwise. I see very little email traffic. I hear very little of anything, really, and I find that I’m pulling information from reluctant teammates. I pushed for a daily scrum, but many people – including my project sponsor – balked at that idea. So in light of the fact that I was not having any daily meetings until last week (sort of), I resorted to using the weekly status meeting that the project sponsor set up. I asked how I thought we were tracking and then asked about blocking issues. To my surprise, the project sponsor wanted these meetings to be about the PM (me) reporting to the team how things were going. I find this very limited, and I end up getting updates from the team anyway. I’m learning that Traditional Project Management is more about going to each person on the team – daily, if need be – and asking them how they’re doing or where they’re at. While this can be great from a relational standpoint, it can also be detrimental. The PM eventually becomes a pest in the eyes of his/her teammates instead of being a trusted source of roadblock-removal. In an environment like the one I’m in, the fact that these teammates are matrixed resources who are far too overloaded doesn't help me when I have to ask them about the status of the project for which I am responsible. They are not happy to see me, so this immediately drives a wedge between us that is sometimes difficult to pry loose. Gathering status one teammate at a time is also a waste. By the time I get status from everyone, the status of the first person I talked to has changed. Also, if I hear of roadblocks, then I have to bounce around from person to person to see if I can clear the roadblock before it becomes an issue. This is why I think daily scrums are so valuable. We can get everything out of the way all at once and keep the team moving forward one day at a time. Don’t even get me started about the tools we’re using to track progress. We have a very high level project schedule in Smartsheet. If you aren't familiar, Smartsheet is an MS Project clone that is all online. We then have a “test control sheet” that lists high level test case names. (Remember my post a few weeks ago pondering the reasons why I, as a PM, was required to put together a test plan? Yeah, this “control sheet” was the end result of that.) On top of the “control sheet,” we have test scripts and individual test plans we’re updating. I have to peruse all these places to see where things are and then somehow keep track of it. I've created a private Trello board just to keep all of this straight. I would much prefer that we had everything tasked out… user stories… something! This is what we have, though, and I have to work with it. While I think Traditional Project Management definitely has its place, in the software world, Agile is a much more efficient way of getting things done. "In order to produce and maintain Quality Code, it is necessary to do continuous cleanup. #agile #scrum"
This is a really good way to get a product off the ground, and the ramp-up is relatively short! I'd love to try this! So... while the agile world is debating whether or not Test Driven Development (TDD) is dead, I'm going to talk about something completely random. 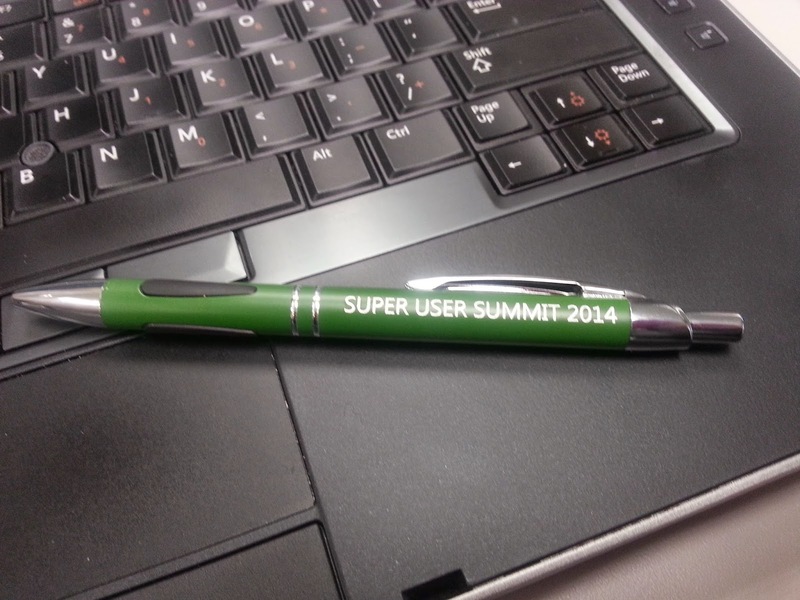 I recently received a pen for speaking at a small Power User Summit in Broomfield, CO. I gave a 20 minute presentation on Agile basics for folks who had no idea what agile was. As a coach, I really wanted to dig into the meat of agile ideals, but I only had 20 minutes. The presentation was a success, and I got a few really good questions. A little later in the day one of the organizers presented me with a rather nice pen. I'm one of those people who appreciates a good writing instrument, and how it writes is more important to me than how it looks. This one writes well. I know it's not an expensive pen. I don't care. I like it. But as I looked at the pen, I began wondering, "What is the coolest piece of swag I've ever received?" Sadly, pens like this one are about as exciting as it gets with me. 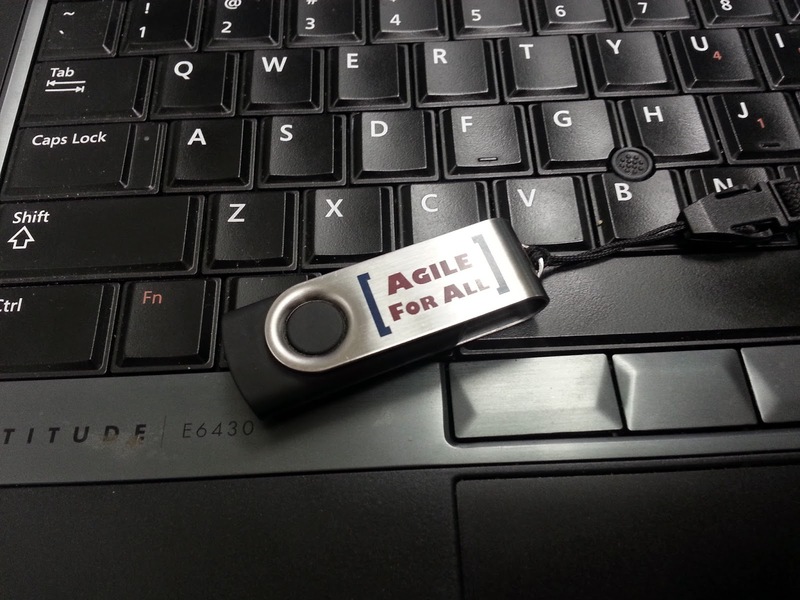 I did get this cool flash drive from Agile For All with all kinds of cool resources on it, though. I love this flash drive. It's awesome. Then I became curious: What's the coolest swag YOU have ever received? If you can, post a photo of said swag in your comments below. I love how everyone assumes that the project manager - ME - already knows everything. I can only wish I was omniscient. It is assumed that I know everyone who is responsible for certain test areas. When I don't and I ask who these people are, I am met with the "duh" look and a brief pause before they answer. It is assumed that I know exactly where to go to get past test scripts and documents, and it is assumed that I will search out said documents for the team... when THEY know where to get them to begin with. It is assumed that I know everyone's schedules and need to set up meetings according to my omniscience. No. I will not rearrange everyone else's schedule for one person, so please stop asking me to. It is assumed that I already know that the project is going to be late. My spidey senses tell me this, but as of now I have no empirical data to prove it. These are just a few examples. I CANNOT wait for my daily stand-ups to begin with this team! I'll at least have SOME idea what everyone is working on. User stories are about stakeholders talking directly with developers, not about writing documents for them. Tell, don't write. No one is sharing information even after I've requested it. I have to pull it from them. For instance, I had no idea that two of my "testers" were even available for my team. I find myself digging for documents after I've asked people to share them, too. Expectations are completely unclear. For instance, I just learned that I - as in ME - need to put together a test plan. For you traditional PMs out there this probably isn't new for you, but I've never done this before. Why? Because I had self-organizing, cross-functional teams that took it upon themselves to take care of this crucial tidbit. Now I get the unsavory task of asking everyone to document what they're doing so far. Communication seems incredibly stifled since we don't yet have daily stand-ups. For instance, dates (such as whether or not we'll have to work over the 4th of July weekend) have been up the air for at least two weeks. AND dare I mention the tester availability thing again? "Retweet this If you play poker just to estimate work, you may be on an agile project"